Dr. Karp, one of the most read - and most trusted - pediatricians in history has made this book convenient to use by breaking it into three sections. Part One covers birth to three months; Part Two, three to twelve months; Part Three, one to five years. Each part ends with an easy-to-read Q&A of the most common questions parents have. Keep this book on your shelf and easily flip through to the section you need. 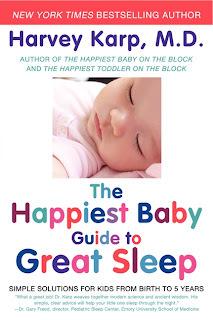 The Happiest Baby Guide to Great Sleep is full of ideas and tips -- some you may have thought of and some you probably haven't. The book is laced with bullet points for you sleep-deprived parents who can't read through a whole book. Just zoom in on the areas in which you need help. I strongly recommend this resource for all parents of young children. These tips will help kids even beyond age five. The Happiest Baby Guide to Great Sleep would also make a wonderful gift for expecting parents. Disclosure: I am participating in a book review campaign with One2One Network. I received this book from Harper Collins for the purposes of reviewing it. I have not received compensation. My participation in the campaign enters me into a drawing for a gift card. All opinions stated are my own.